2.How much cash do you have on you? 3.What’s a word that rhymes with DOOR? 6.Why is there always a missing question? So that there is always an answer for someone to use. 7.What does your watch look like? 8.What were you doing at midnight last night? 9.Where is your nearest 7-11? 10.What’s a word that you say a lot? Cool - yeah I know... but it just comes out. 11.Who told you he/she loved you last? 12.Last furry thing you touched? 13.How many rolls of film do you need developed? 14.Favorite age you have been so far? 16.What is your current desktop picture? 17.What was the last thing you said to someone? 18.The last song you listened to? 19.What time of day were you born? Early morning.. I always forget.. HEY I was just a baby, I couldn’t tell time! 20.What do you do when vending machines steal your money? 21.Do you consider yourself kind? 23.Name three things you have on you at all times. 24.Can you change the oil on a car? 25.When was the last time you wrote a letter to someone on paper and mailed it? About a month ago to a creditor! The desktop picture rocks big time - and you do as well! I love that pic of Matt. And I would just like to sit in chair in the shade dringking peach iced tea watching you change the oil in a car. Yup. Hello -- I have been unable to sign in to my Blogger dashboard since I saw this. I'll meme as soon as I can. Mine's up. That was fun. Oh and I love the pic of Matt. 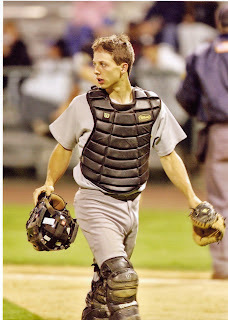 Reminds me a lot of my Matt in that catcher's uniform. Aha! I'm glad to read I'm not the only silly person to keep putting money into a broken/jammed vending machine! I swear the other day I must have paid $10 for a coke. Do you have the old B&W Birth Certificate? It has the time of birth on it. Not the new green/blue ones though. I am 1:55am, I remembered that from the old Certificate. Okay -- I FINALLY was able to post my meme/answers!!! And -- I was ALSO able to comment on your blog to let you know! You didn't tag me, but Turn did (a WOOOOOOOOOOOOO to my girl). Not bad. I am doing it tomorrow. Good post! Hello there, I've seen your user name splashed all over many a blog so thought I would come by to check things out over here at the big leather couch. It seems nobody wears watches anymore. Is it because we don't want to know how long it's taking to get through the dang day? Or is it because there's a clock on the computer, and a clock on the cell phone, and a clock in the car, and a clock on the DVD player, and a clock on the TIVO, and a clock on the Ipod/MP3 player, and a clock. . .
. . .well, I think you get the idea. BUSY: Yes I do, I will have to look. ANGELL: I'll get ya on the next one.. BUD: Can't wait to read. Wonderful responses that was such a laugh and quite informative! My favorite response was 22 to what is your life motto: "Keep that spark of insanity and they can’t steal your being" that's so true! TISHA: Part of an old Robin willimas bit and I took it to heart. Cool answers, Vinny and I think Travis hit the nail on the head about why no one seems to wear a watch anymore. I was tagged and have it done but I'm not posting it till later. Fun little thingy, huh? I've missed hanging out on The Couch!